Most readers will associate Microchip's name with the ubiquitous 8-bit PIC microcontrollers but it is the new 16-bit PIC24F family that is truly stealing the scene. Orders of magnitude increases of performance, memory size and the rich peripheral set make programming these devices in C a must. This new guide by Microchip insider Lucio Di Jasio teaches readers everything they need to know about the architecture of these new chips: How to program them, how to test them, and how to debug them. Di Jasio's common-sense, practical, hands-on approach starts out with basic functions and guides the reader step-by-step through even the most sophisticated programming scenarios. 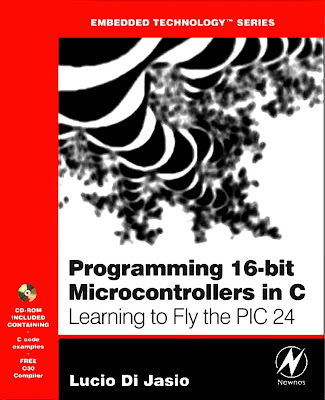 Experienced PIC users, including embedded engineers, programmers, designers, and SW and HW engineers, and new comers alike will benefit from the text's many thorough examples, which demonstrate how to nimbly sidestep common obstacles and take full advantage of the many new features. La mayoría de los lectores asociar el nombre de Microchip con los microcontroladores PIC de 8 bits en todas partes, pero es el nuevo 16-bit de la familia PIC24F que es realmente el robo de la escena. Los pedidos de aumentos de la magnitud de rendimiento, tamaño de memoria y el conjunto periférico rico que la programación de estos dispositivos en C una necesidad. Esta nueva guía de información privilegiada por Microchip Lucio Di Jasio enseña a los lectores todo lo que necesitan saber acerca de la arquitectura de estos nuevos chips: Cómo programarlos, cómo probarlos y cómo depurarlos. Di Jasio de sentido común, práctico, enfoque práctico comienza con funciones básicas y guía al lector paso a paso a través de incluso los escenarios de programación más sofisticadas. Los usuarios experimentados PIC, incluyendo ingenieros embebidos, programadores, diseñadores, ingenieros y SW y HW, y recién llegados se beneficiarán de muchos ejemplos a fondo del texto, que demuestran cómo esquivar ágilmente los obstáculos comunes y sacar el máximo provecho de las nuevas características. A LOOP IN THE PATTERN. MORE PATTERN WORK, MORE LOOPS. THE FIRST FLIGHT. Flight plan. Preflight checklist. The flight. Compiling and linking. Building the first project. PORT initialization. Retesting PORTA. Testing PORTB. Post-flight briefing. Notes for assembly experts. Notes for PIC MCU experts. Notes for C experts. Tips and tricks. Exercises. Books. Links. A LOOP IN THE PATTERN. Flight plan. Preflight checklist. The flight. An animated simulation. Using the Logic Analyzer. Post-flight briefing. Notes for assembly experts. Notes for PIC microcontroller experts. Notes for C experts. Tips and tricks. Exercises. Books. Links. MORE PATTERN WORK, MORE LOOPS. Flight plan. Preflight checklist. The flight. Do Loops. Variable declarations. for loops. More loop examples. Arrays. A new demo. Testing with the Logic Analyzer. Using the Explorer16 demonstration board. Post-flight briefing. Notes for assembly experts. Notes for PIC microcontroller experts. Notes for C experts. Tips and tricks. Exercises. Books. Links. NUMBERS. Flight plan. Preflight checklist. The flight. On optimization (or lack thereof). Testing. Going long. Note on the multiplication of long integers. Long long multiplication. Floating point. Notes for C experts. Measuring performance. Post-flight briefing. Notes for assembly experts. Notes for PIC microcontroller experts. Tips and tricks. Math libraries. Complex data types. Exercises. Books. Links. INTERRUPTS. Flight plan. Preflight checklist. The flight. Nesting of interrupts. Traps. A template and an example for Timer1 interrupt. A real example with Timer1. Testing the Timer1 interrupt. The secondary oscillator. The real-time clock calendar (RTCC). Managing multiple interrupts. Post-flight briefing. Notes for C experts. Notes for assembly experts. Notes for PIC microcontroller experts. Tips and tricks. Exercises. Books. Links. TAKING A LOOK UNDER THE HOOD. Flight plan. Preflight checklist. The flight. Memory space allocation. Program space visibility. Investigating memory allocation. Looking at the MAP. Pointers. The heap. MPLAB C30 Memory Models. Post-flight briefing. Notes for C experts. Notes for assembly experts. Notes for PIC microcontroller experts. Tips and tricks. Exercises. Books. Links. PART II – FLYING “SOLO”. COMMUNICATION. Flight plan. Preflight checklist. The flight. Synchronous serial interfaces. Asynchronous serial interfaces. Parallel interfaces. Synchronous communication using the SPI modules. Testing the Read Status Register command. Writing to the EEPROM. Reading the memory contents. A nonvolatile storage library. Testing the new NVM library. Post-flight briefing. Notes for C experts. Notes for the experts. Notes for PIC microcontroller experts. Tips and tricks. Exercises. Books. Links. ASYNCHRONOUS COMMUNICATION. Flight plan. Preflight checklist. The flight. UART configuration. Sending and receiving data. Testing the serial communication routines. Building a simple console library. Testing a VT100 terminal. Using the serial port as a debugging tool. The matrix. Post-flight briefing. Notes for C experts. Notes for PIC microcontroller experts. Tips and tricks. About the ICD2 and UARTs on ICE. Exercises. Books. Links. GLASS BLISS. Flight plan. Pre-flight checklist. The flight. HD44780 controller compatibility. The Parallel Master Port. Configuring the PMP for LCD module control. A small library of functions to access an LCD display. Advanced LCD control. Post-flight briefing. Notes for C experts. Tips and tricks. Exercises. Books. Links. IT’S AN ANALOG WORLD. Flight plan. Preflight checklist. The flight. The first conversion. Automatic sampling timing. Developing a demo. Developing a game. Measuring temperature. The breath-alizer game. Post-flight briefing. Notes for C experts. Tips and tricks. Exercises. Books. Links. PART III – CROSS-COUNTRY FLYING. CAPTURING INPUTS. Flight plan. The flight. The PS/2 communication protocol. Interfacing a PIC24 to the PS/2. Input Capture. Testing the Input Capture method using Stimulus Scripts. Testing the PS/2 receive routines. The simulation. The Simulator Profile. Another method – Change Notification. Evaluating cost. A third method – I/O polling. Testing the I/O polling method. Cost and efficiency of the solution. Completing the interface: adding a FIFO buffer. Completing the interface: performing key codes decoding. Post-flight briefing. Tips and tricks. Stalling transmissions from the keyboard – Open-Drain Output Control. Exercises. Books. Links. THE DARK SCREEN. Flight plan. The flight. Generating the composite video signal. Using the Output Compare modules. Memory allocation. Image serialization. Building the video module. Testing the video generator. Measuring performance. The dark screen. A test pattern. Plotting. A starry night. Line drawing. Bresenham algorithm. Plotting math functions. Two-dimensional function visualization. Fractals. Text. Testing the TextOnGPage module. Developing a text page video. Testing the text page performance. Post-flight briefing. Tips and tricks. Exercises. Books. Links. MASS STORAGE. Flight plan. The flight. The SD/MMC card physical interface. Interfacing to the Explorer16 board.. Starting a new project. Selecting the SPI mode of operation. Sending commands in SPI mode. Completing the SD/MMC card initialization. Reading data from an SD/MMC card. Writing data to an SD/MMC card. Using the SD/MMC interface module. Post-flight briefing. Tips and tricks. Exercises. Books. Links. FILE I/O. Flight plan. The flight. Sectors and Clusters. The File Allocation Table (FAT). The Root Directory. The treasure hunt. Opening a fi le. Reading data from a fi le. Closing a fi le. Creating the fileio module. Testing fopenM() and freadM(). Writing data to a fi le. Closing a fi le, second take. Accessory functions. Testing the complete fi leio module. Code Size. Post-flight briefing. Tips and tricks. Exercises. Books. Links. VOLARE. Flight plan. The flight. Using the PIC24 OC modules in PWM mode. Testing the PWM as a D/A converter. Producing analog waveforms. Reproducing voice messages. A media player. The WAVE fi le format. The play() function. The low level audio routines. Testing the WAVE fi le player. Optimizing the fi le I/O. LED Profiling. Looking under the hood for more. Post-flight briefing. Tips and tricks. Exercises. Books. Links. Esto si es un buen libro !!!!! Un saludo de Manel desde Barcelona, España.